Ahhhhh…spaghetti squash. I was introduced to the awesomeness of this vegetable many years ago, and we’ve had many happy meals together since. Today, I’m sharing my Spaghetti Squash and Sausage Bake Recipe, which features my favorite squash and utilizes it to create a creamy, cheesy and satisfying dish that is absolutely delicious. I added in some chicken sausage for extra flavor and added protein. It takes a bit more time to make, simply because the squash needs to be roasted beforehand, but it’s well worth the effort. If you are really pressed for time, you can microwave the squash fully, instead of roasting it. I prefer the roasted flavor, but the microwave option works just fine. Using the squash instead of pasta noodles saves a ton of Weight Watchers Points, and offers a lot of extra nutritional benefits as well. Plus, it just tastes delightful! This Spaghetti Squash and Sausage Bake was rich, velvety, cheesy, and everything I had hoped for! Creamy, cheesy, and deliciously comforting, this spaghetti squash recipe is rich and satisfying enough to be served as a main dish but works well as a side too. It’s a healthier, lower carb alternative to a pasta dish, and is a great Weight Watchers recipe. Preheat oven to 400. Lightly mist a 9” x 13” baking dish with cooking spray. With a sharp knife, pierce some holes all over the squash. Place it in a microwave safe dish and microwave on high for about 7 minutes. This will soften the squash enough so that it can be cut in half. Let squash cool about 10 minutes before handling. Once squash has cooled, cut it in half lengthwise and scoop out all the seeds. Lightly mist both halves with an olive oil mister and sprinkle with salt. Place in a shallow baking dish with about 1/2 “ of water (cut sides up), and roast in the oven for about 30-40 minutes, or until squash is tender. When squash is cool enough to handle, scrape with a fork to remove flesh in long strands, and place strands in a large bowl. Add the cooked sausage into the squash. In a medium sized sauce pan, melt butter over medium high heat. Stir in the flour to form a roux. Then slowly whisk in the milk, broth and garlic. Bring to a boil, while whisking constantly. Then lower heat to medium, stir in the parmesan and sage, and continue stirring until sauce thickens. Pour sauce over squash and mix well and season with salt and pepper. Pour squash into prepared baking dish, and sprinkle with mozzarella cheese, then top with the Panko breadcrumbs and dried parsley. 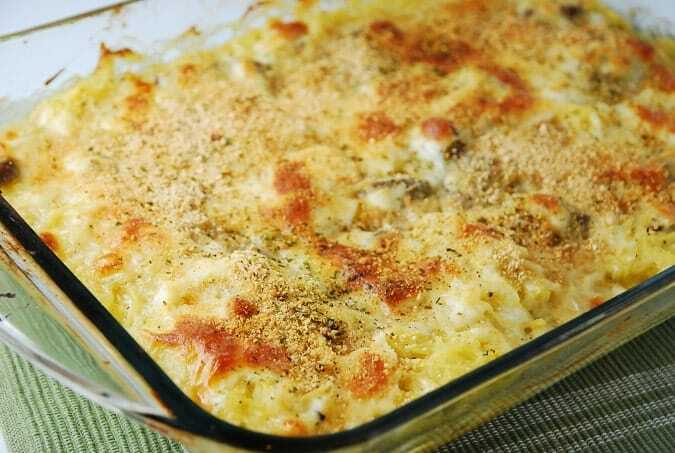 Place in oven and bake until heated through and cheese is melted and bubbly, about 30 minutes. Let cool for about 5 minutes. Cut into 8 equally sized servings. OMG….. I made this tonight for dinner. I excepted it to be good as all your recipes are (I make a new one every week or two) but this was INSANELY RICH, YUMMY, CREAMY, SOOOOOO TASTY. I used 8oz of sundried tomato and basil turkey/chicken blend sausage from my local butcher. Used Ian’s gf panko bread crumbs as I was out of regular panko. I used 1% milk instead of 2% (only small container of organic in the store) and I had cut of jicama for the side dish ;-) would be delicious with a green salad also. YUM! THANK YOU I WILL TOTALLY BE MAKING THIS AGAIn !!! My new FAV recipe!! This was very good. Made according to recipe. Had 12 points of my allowed 19 left for dinner. Ate 1-1/2 cups — and nothing else. Should have been 6 points for this recipe with 6 more left. HOWEVER, my weight was UP the next morning. Not to say it wasn’t good. I loved it, but it didn’t work for WW! If I make again, I would do half of the sauce and cheese so I would be able to taste the spaghetti squash more and cut out all the “white” fattening ingredients. This sounds deelish…question though…are you adding the sausage to the spaghetti squash raw? Cannot wait to try this! Just made and ate this yummy recipe. So GOOD, highly recommend!!!! OMG, made this last night and wasn’t expecting alot. I knew I liked spaghetti squash, but the chicken sausage I was nervous about. I have never had it before, and WOW WOW WOW. This blew my mind of how good it was. This recipe is definitely a keeper! Wow, I made this today …. used 2 links of Portuguese sausage from a local butcher. Instead of 1 cup 2% milk i used 1 cup lite coconut milk for the roux…. and instead of 2 TB whole wheat flour I used 2 TB brown rice flour….. Then I used Udi’s gluten free breadcrumbs on top. IT WAS AMAZINGGGGGGGGGGGGGGGG!!! thanks for the amazing recipe I could sub to be gluten free :) You rock! I love spaghetti squash, and I didn’t expect to. I’m pretty committed to pasta in any form, so the thought of using a substitute was in no way appealing to me. But I tried it and I loved it. I will definitely be trying this soon.